I get easily excited by all the new feeding products for babies these days, with all the new innovative products being sold to make lunchtime easy as well as fun, it's hard not too! 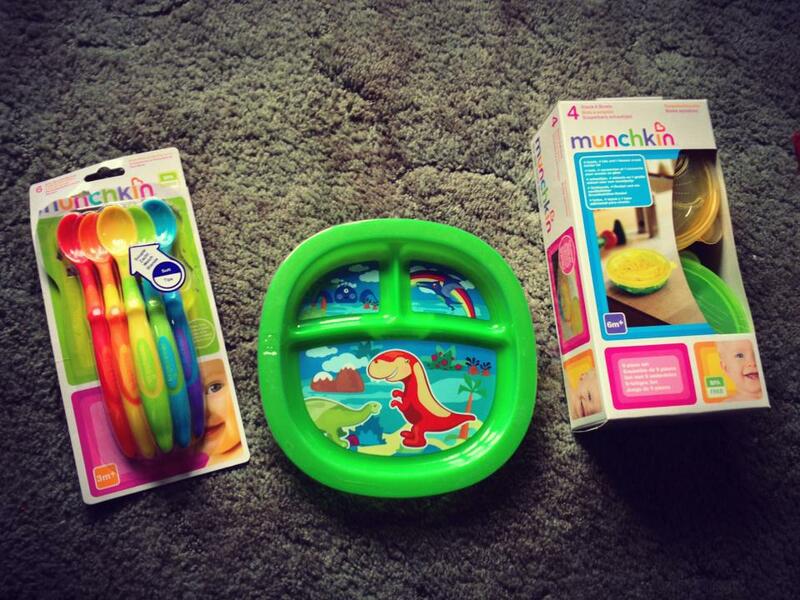 We were very lucky to have recently received some lovely feeding products from Munchkin which both kids have been testing out this time. With over 20 years in the industry Munchkin have certainly proved their popularity and can be found in a wide range of leading retailers both online and instore. The items we received were a 4 pack of Stack-A-Bowls with snack lid, a dinosaur deco toddler plate and a pack of six soft tip spoons. These are suitable for use from 3 months, so for whenever you start weaning your baby, these spoons are ideal. They are rounded and soft making them gentle on baby's gums. The long handle makes them easy to reach the bottom of jars or containers of baby food, whether its homemade or shop-bought and each pack contains six different bright vibrant colours making them attractive to your baby. I've always found with both of mine that they knew it was dinner time as soon as they spotted the spoon, so the bright colours reaally help make them stand out. Although they are advertised as weaning stage spoons that doesn't mean they are limited to just babies, Gracie has been using them too for her yoghurt and cereals and has had no problem picking up food with them as the tip is fairly sized. These are suitable from 6 months, so when you start being more adventurous with textures and introducing snacks. The plate has three sections, one large and two smaller sections, this is to encourage healthy eating habits. They come in four different designs suitable for both boys and girls and there are matching bowls also available. I've recently started giving Zach more snacks to encourage him to try different textured foods, I've been using this plate to put a few different options on for him to pick at and he is loving being trusted with a plate! I usually just stick them on the tray for him. Of course Gracie could't be left out and as the plate is new and exciting she's also been using it for her dinners.I would definitely say the plate is suitable for both babies and toddlers, especially when trying to teach babies to use a plate. These are also suitable from 6 months. The set includes 4 x 7oz bowls with spill proof lids and 1 snack catcher lid. These are great as you have two different functions for them they can be used to store food and keep it fresh with the tightly sealed lids or they can be used with the snack catcher lid, which is great for out and about if your child is picking at food and you don't want them to tip the contents everywhere. The lid is a lot softer than I expected making it perfect for little hands to get in and out. Zach hasn't quite realised how to do it yet! but Gracie has been helping him and can get into it perfectly. Although by helping she's also been sneakily stealing his snacks. It's a good job he loves his big sister or she'd be in big trouble! We were sent the items featured free of charge for review purposes but all opinions are completely my own.